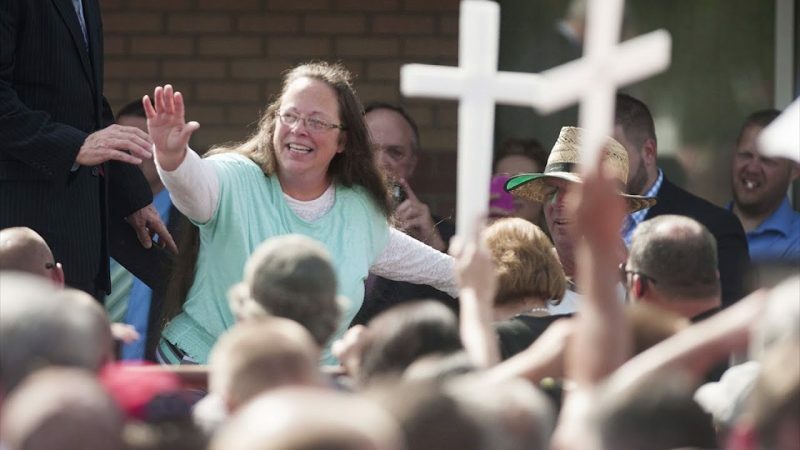 In September 2015, Kim Davis, the clerk of Rowan County, Kentucky, spent five days in jail for defying a court order to issue marriage licenses after the Supreme Court had ruled state gay-marriage bans unconstitutional. Her case became a rallying cry for Religious Right activists who had warned that advances in equality for LGBTQ people would spell the end of freedom for conservative Christians, and put her attorneys at the far-right anti-LGBTQ organization Liberty Counsel on the national map. In February, Liberty Counsel published a book on the saga written by Davis “with” Liberty Counsel’s founder, Mat Staver, and its director of creative services, John Aman. The book, “Under God’s Authority: The Kim Davis Story,” is available for a $25 donation to Liberty Counsel. After Beshear, the next people to turn their backs on Davis, in her telling, were her fellow county clerks, all but two of whom “reversed course” and agreed to issue marriage licenses under mounting pressure. With his hands folded, Doc sat up and leaned forward as I talked. 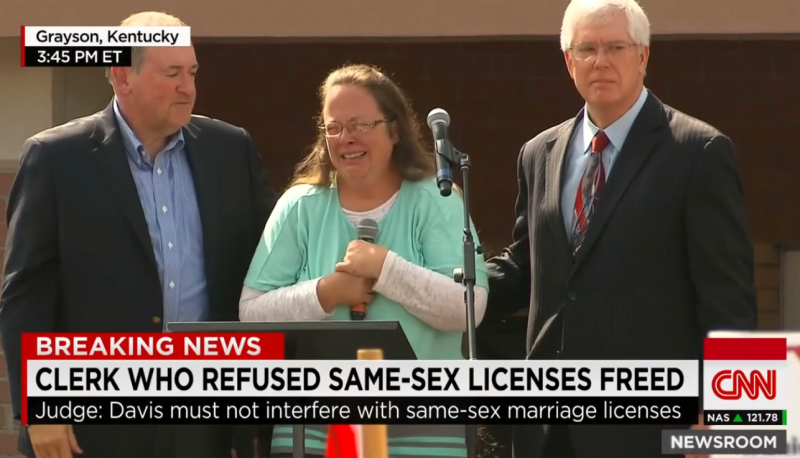 Eventually, Judge Bunning orders Davis to be jailed until her office starts issuing marriage licenses again. Davis writes that she felt at peace during her time in jail, and used the opportunity to read and re-read Martin Luther King Jr.’s “Letter from Birmingham Jail.” “I would have been right there with Dr. King because I am appalled by and opposed to racism in any form,” she assures readers. While Davis’ story has many villains, there are a few knights in shining armor. First, Liberty Counsel seeks out Davis and represents her in her case. While politicians “abandoned me,” she writes, “Liberty Counsel stuck with me all the way and its wonderful attorneys and staff have become dear friends.” Davis describes Liberty Counsel’s work in glowing terms, from its “brilliant argument” in a Supreme Court appeal that still did not “open the Justice’s blind eyes” to the “beautiful briefs” they wrote on her behalf. “God gave me another champion, too,” Davis writes: Matt Bevin, “a godly man who lets the Lord lead and guide him.” Bevin used Davis’ case as a campaign issue, and she recorded a robo-call for him. Bevin won his election, which Davis chalked up to “supernatural intervention,” and quickly issued an executive order removing county clerks’ names from marriage licenses. When the House sergeant-at-arms cried out, ‘Mr. Speaker, the President of the United States,’ Obama entered and cheers filled the chamber. To be honest, I did more praying for the President than clapping as he worked his way to the rostrum. I wasn’t in awe of him at all because he didn’t represent what I valued. If I could have gotten close enough, I would have put my hand on the President in prayer. That wasn’t possible, so as the crowd cheered, I simply asked God to bring the President’s will into alignment with His divine will, and bring his ungodliness to an end so righteousness can triumph. In addition to her trip to the State of the Union, Davis writes of her meeting with Pope Francis, rejecting the Vatican’s attempts to downplay the extent of the pope’s support for her. Bevin and Johnston provided blurbs for the book, along with evangelists Franklin Graham and James Robison, GOP operative and pseudo-historian David Barton, anti-equality activists Michael Brown and Deacon Keith Fournier, and National Hispanic Christian Leadership Conference president Samuel Rodriguez.